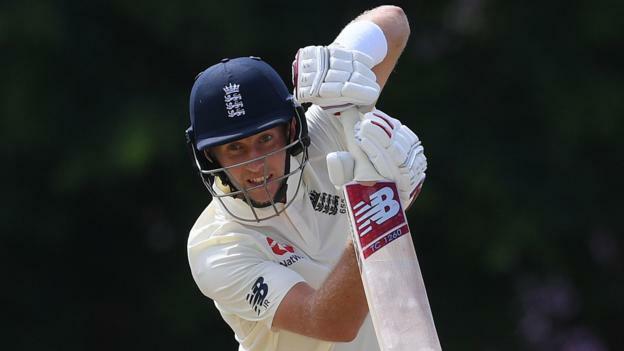 Captain Joe Root hit 87 before England collapsed on day one of their first warm-up match in the West Indies. Root, 27, struck 12 fours and two sixes in his 87-ball innings before falling to Bryan Charles, who claimed 5-90 for a Cricket West Indies President’s XI. Ben Stokes made 56 and Rory Burns 35 as England reached 217-4, before the tourists lost five wickets for 31 runs. They finished on 317-10 in Barbados, in a 12-a-side game in which batsmen can return to the crease. Having been caught at short leg for 10 earlier on Tuesday, opener Jennings reached the close unbeaten on 15 at the Three Ws Oval. Jonny Bairstow, batting at three, was caught behind for four and all-rounder Sam Curran fell for a two-ball duck. The hosts will bat on the second and final day of the tour match on Wednesday. After another two-day game against a President’s XI on Friday and Saturday, England face West Indies in a three-Test series starting at the Kensington Oval in Barbados on 23 January.